I admit it, I’m a slacker. I haven’t started my seeds this year. In fact, i just barely purchased my organic herb seeds for container gardening this year. But it’s better late than never, right? My 6 year old has been anxious to help plant the seeds I just haven’t gotten around to it since I wasn’t sure which ones would be good for containers. I really want to grow a garden with my kids, but I don’t have a yard to do it in. 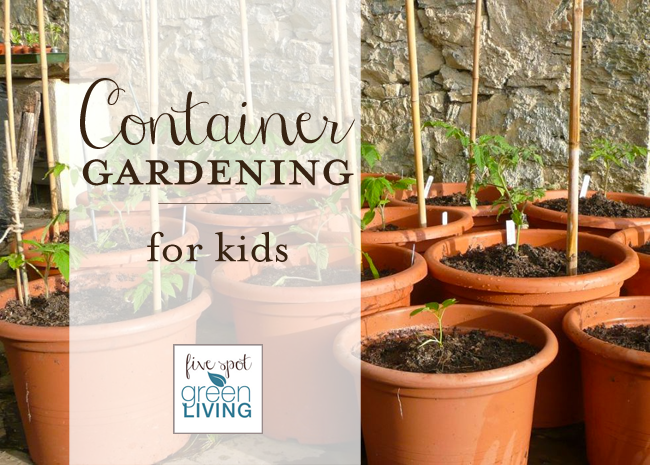 But what grows well in containers that’s simple and something kids will enjoy? Simply put, pretty much any vegetable or herb will grow well in a container as long as there’s enough room. Here are the ten best plants that you can grow in containers with your children. Tomatoes – This is probably the most popular choice for growing in containers. Tomatoes are easy to grow; they can even be done from a hanging container and grow upside down. 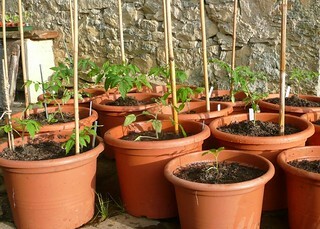 Using good soil and the right amount of water is what’s needed to make tomatoes grow well in containers. Potatoes – You can grow a large amount of potatoes in containers like compost bags or a large tub. Cucumbers – These are easy to grow in containers, but they need the right conditions. They grow best in warm temperatures so don’t plant until early summer for best results. Carrots – These are so simple to grow and do really well in containers. So they’re a really great starter vegetable to grow with children. Blueberries – These grow well in containers, but only with the right conditions. They ripen best in heat so they’re best saved for the summer. They require rain water too, so grow them outdoors unless you are able to collect the rain water in something. They won’t do well with tap water. Parsley – This is great in a window box. It takes a while to germinate though and requires heat. Also, be sure to use a rich soil. Basil – Put it in the window box with parsley, but be warned: this does not do well at all with cold. So make sure there is not going to be any frost. Basil has a few weeks’ germination time, though, so it grows quicker than parsley. Radish – This is probably the easiest vegetable to grow in a container and will really get the kids excited. So this is the perfect choice. Lettuce – This is actually a great choice for growing in containers. Water in the morning and make sure it is kept in the shade and you’ll have a quick and easy plant in a container in no time. Flowers – It doesn’t have to be vegetables alone that you plant in containers. Potted plants such as geraniums, petunias, mums, and sunflowers are great in a pot and something kids will love to help cultivate. Planting anything with kids can be a whole lot of fun and very educational. Getting kids to eat more vegetables, then planting some sort of garden will be a huge help in that. Letting them get their hands dirty and eating the food they make is a huge incentive for even the pickiest of eaters. So don’t think just because you don’t have a lot of room you can’t create some sort of garden. 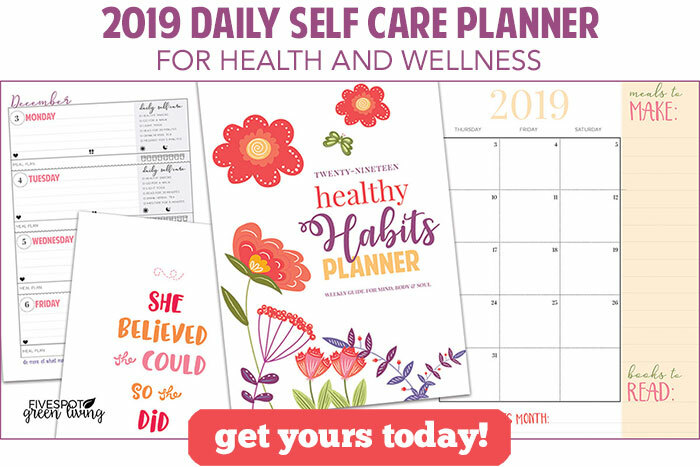 Hanging tomatoes and window boxes with herbs and including some containers on your porch of radishes and potatoes and you’re off to a great start -gardening with the kids and getting them to try more fruits and vegetables. What have you grown in containers before? Container gardening is the only way I grow flowers of any foods now. My health just won’t allow anything else. I have a little niece that I have help plant some radishes and carrots. Radishes because they grow and mature so quickly and carrots because she loves them. I would love to try potatoes, I’ve heard the price of them is about to skyrocket. So I say better late than never! I heard that about potatoes, too! I would love to grow carrots, but haven’t tried it yet. I love container gardening. My tomatoes and peppers grow nicely in them. It’s also a great way to introduce kids to gardening. We love container gardens! We have a window garden in the late winter/early spring. (CONTAINER GARDENING WITH KIDS) What a great way to garden with your kid’s and be able to teach them all about gardening too.